When you think of name tags, the boring “My Name Is” stickers may come to mind. But no longer. You might be surprised at all the creative name badge and tag ideas that you can incorporate into your own needs that are not only personalized but also fun. Whether you run a business with customer-facing employees or are hosting an event, there are all kinds of uses for name badges. You can even use them at large weddings, baby showers and family reunions. Pretty much anywhere there’s a gathering of people and you want to make introductions and remembering names easier, there’s a use for name tags. Because let’s face it, asking someone his or her name for the fifth time is just a.w.k.w.a.r.d. Name tags may seem like a formality. But here’s the deal: We all like to hear the sound of our own names. So there are situations where having some readily seen identification works to our benefit. Whether you need employee name tags, conference badges, desk name plates or personalized luggage tags, there is a misconception that these items all look the same and can be ordered out of any online catalog. While it is true that there are a lot of stock designs available, it’s just as true that there are many options for creating custom name badges—if you know where to look. And for those with an artistic spirit, we’ll even have some DIY tutorials so you can dive in and make your own. Let’s get started. Often part of an employee uniform program, employee name tags allow your staff to easily be identified by customers. They’re typically a simple, easy-to-read design that includes a company name/logo, employee name and job title (if applicable). Because they’re reusable, these custom name tags must be durable enough for daily wear. As such, most tags will be made from sturdy materials such as wood, metal or plastic (two-color acrylic is a popular choice) and are often laser engraved. To get an idea of what’s available, check out these basic versions from Amazon that have either a magnetic or pin backing. Etsy is another place for inspiration. 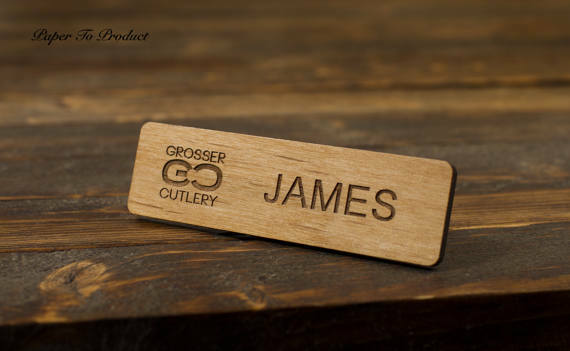 The PaperToProuduct shop has a selection of personalized name badges with finishes in alderwood, bamboo and birch woods as well as gold or silver acrylic. If you want to make them yourself through a laser cutting service, just create the design you want and affix the fastener of your choice. Whether you’re hosting a tradeshow , education summit, sales meeting or networking event, conference name tags are essential. Not only do they serve as admittance credentials, but event name badges also allow attendees to effortlessly interact with one another. If you want participants to successfully mingle, there must be a strategy that makes people much more approachable by sharing some information about them. 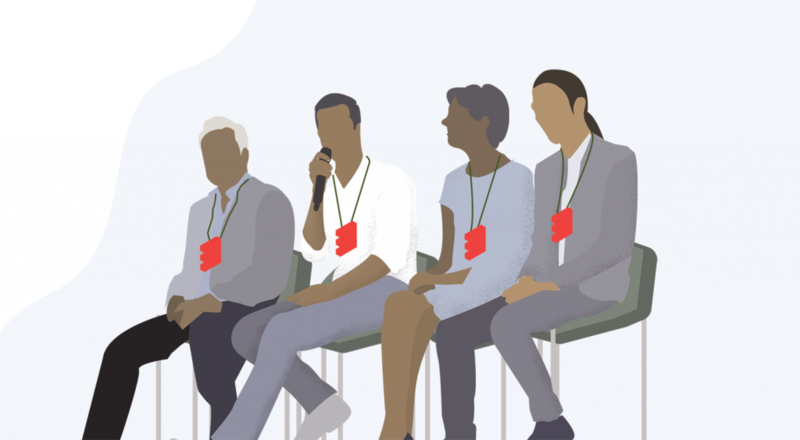 Most conference name badges include the event name, logo and year and are personalized with the attendee’s name, company, job title and often event role (such as speaker, exhibitor, etc.). One of the easiest, and most popular, ways to create these name badges is simply printing the credentials and displaying them in a plastic sleeve that can either be attached to clothing or hung from a lanyard. 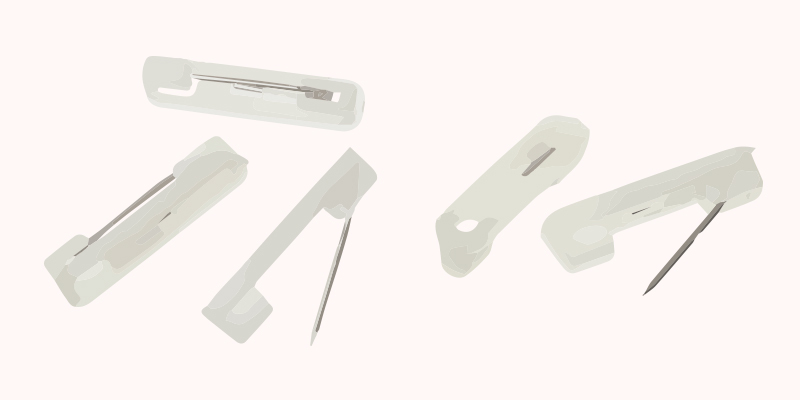 For small jobs, office supply retailer Avery has the supplies and templates to get you started. Companies such as Ticket Printing offer event badges with high-quality media options, unique barcodes, names, holograms and glossmarks. You can design and get them printed here. And event organizing software firms such as Eventbrite also have basic versions for a quick-and-easy way to generate name badges. 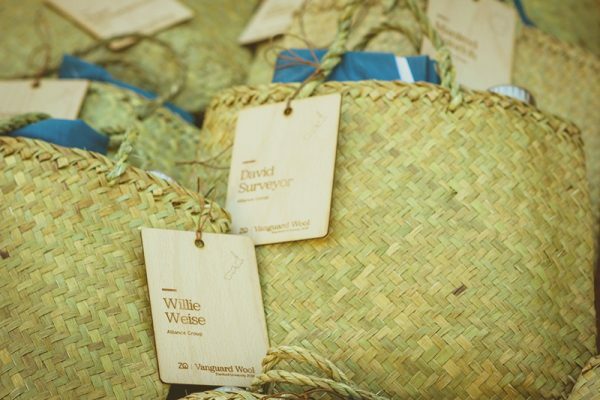 But as branding for events has become more creative, so have their associated name tags. Canva has a drag-and-drop name tag maker that incorporates images, icons, fonts and colors to create more visually intriguing options. While printed name badges are typically single use, some event organizers want something more substantial that can also be used as a memento of the event. 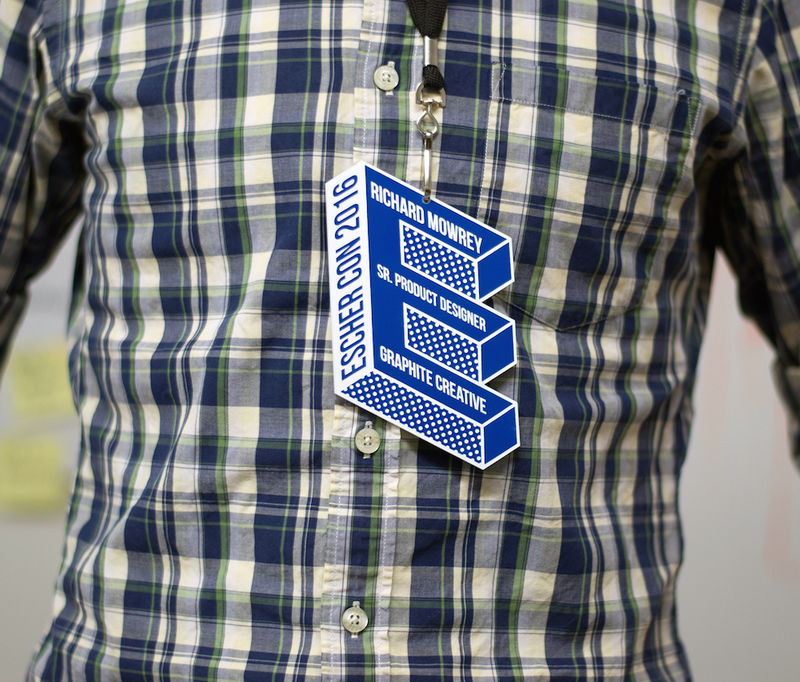 We had a little fun creating some conference name badges of our own out of two-color acrylic. If artist M.C. Escher were to host a conference, we’re sure he’d appreciate this play on perspective. The New Zealand Merino Company Limited used engraved plywood for these conference badges. These custom bamboo badges were not only laser engraved with the Admin Bash logo but also with each Office Ninja’s name. Paired with swag bags filled with $200+ of special giveaways, these name badges were keepsakes for long after the event concluded. Get the virtual tour of the event here and see all the professional pics via Cheshire Isaacs of Cheshiredave Creative here. 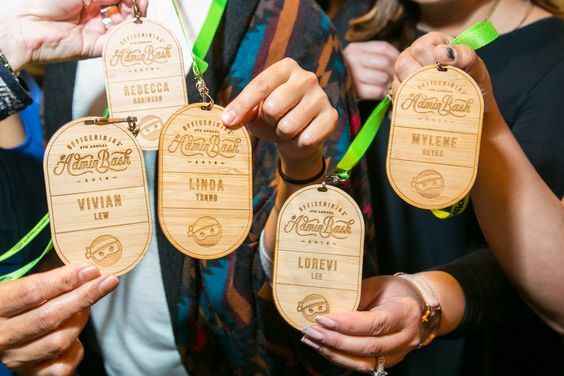 For even more inspiration, Event Manager Blog did a roundup of incredibly creative attendee badge ideas to get your put your creativity into high gear. Whether you’re creating employee name tags or event badges, there’s one commonality: Customization. These aren’t products you can order in bulk and then use as needed because they must be personalized with people’s names. 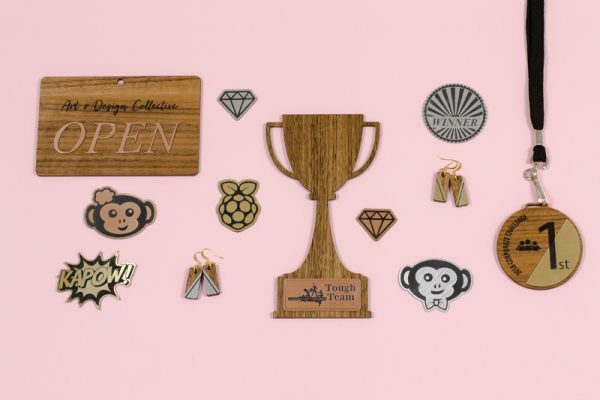 Since laser cutting allows you to create custom designs and make on demand, it’s perfect for this purpose. 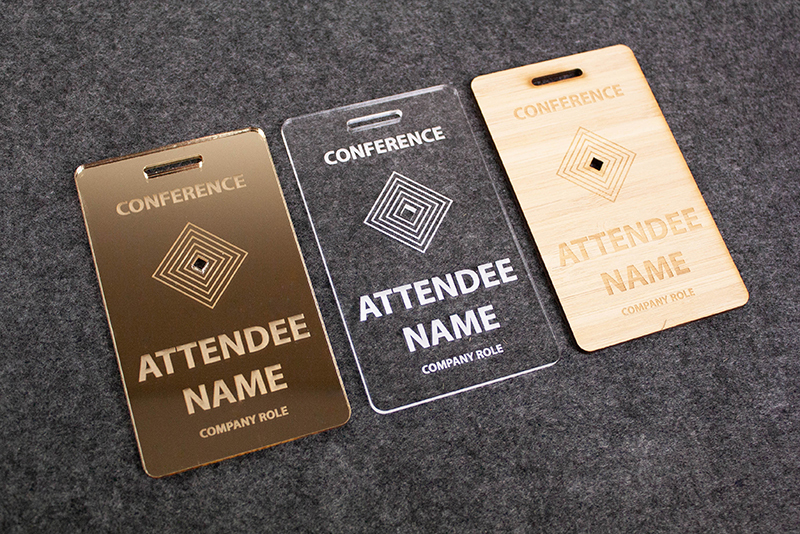 Here’s an example of custom laser cut and engraved event badges in three different materials: Gold mirror acrylic, clear acrylic and amber bamboo). While the cutting and engraving is identical on each badge, the overall look and feel is different depending which material is used. Laser cutting requires a digital design file made in software, such as Adobe Illustrator or Inkscape, that contains vector paths for engraving and cutting. This screenshot of the design file used for the above badges shows the blue lines for cutting and black fills for engraving. Use this as a template for your own badge design by downloading a copy of the file here. If you’re having an event, it’s unlikely that you’ll just be making one badge. Rather, it’s more economical to create a full-sheet layout to make a larger quantity of badges all at the same time. Once the design file is ready, just send it to a laser cutter like a regular print job. If you have access to a local laser cutter, you can play with the machine yourself. But if you don’t, simply upload the file and order from a laser cutting service such as Ponoko. Similar to the portable name tag, desk name plates are a more permanent identification solution when in an office setting. They perform a similar function in that they specify an office name (such as accounting or marketing) or they serve as a name sign at a person’s desk or cubicle. 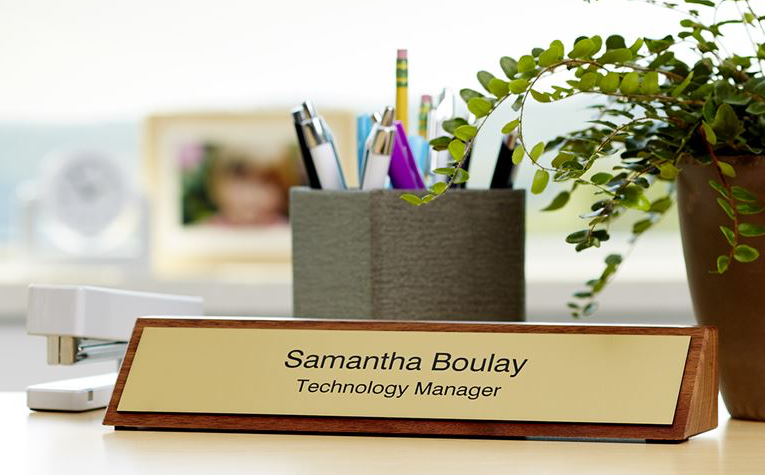 Often made from metal, wood or plastic for durability, desk name plates are typically customized via printing or engraving the person’s name, title or department. For inspiration, check out some basic styles from Vistaprint such as this solid walnut block with an engraved brass name plate. But if the standard 2” x 10” name plate feels a bit too corporate for your liking, design your own custom version that includes any typestyle and visuals your heart desires. Then use a laser cutting service to get it made. A cousin to name badges, luggage tags are basically name tags for your bags. 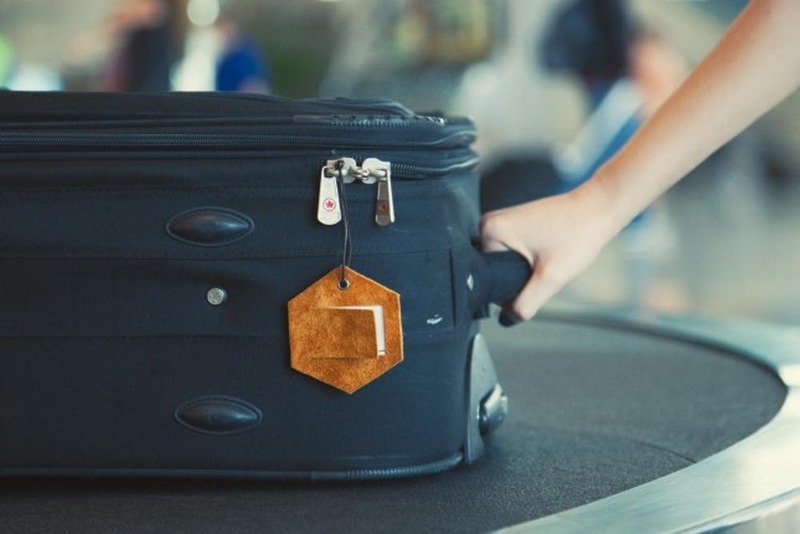 In a world of black suitcases that have little differentiation, a custom tag helps you easily identify your belongs in a busy airport, sea port, bus terminal or train station. While the paper suitcase tags provided at check-in will get the job done, they easily get bent or torn. So having a more durable choice makes sense, especially if your luggage gets lost and the transportation provider needs your contact information to schedule bag delivery at a later time. Luggage tags can be made from a variety of materials (fabric, leather, wood, plastic, metal) in various styles that can be decorated via ink, lasers, a punch or transfer. Many are created like a sleeve that allows you to insert a business card or handwritten contact information, while others are truly personalized. For inspiration, Etsy has all kinds of options from subtle embossed leather and embroidered polypropylene webbing to colorful prints sealed inside plastic laminate. You can also see the wide range of straps, too, from buckles to split rings to metal screw clasps. 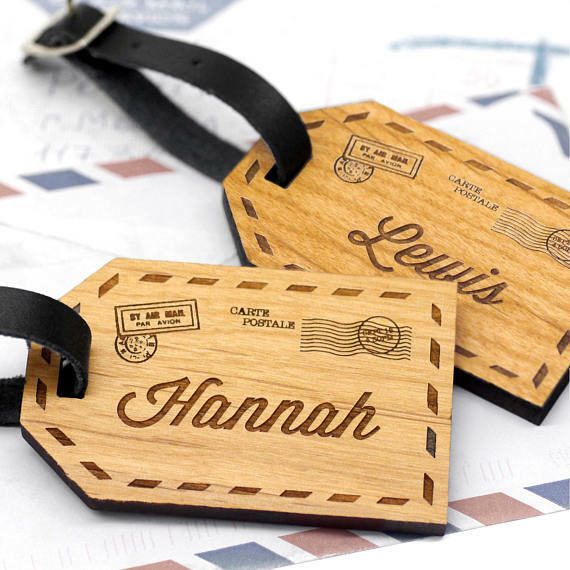 This set of personalized luggage tags from Etsy seller mariaallenboutique is made from sustainably sourced alderwood and is laser engraved with the traveling couple’s names in a vintage airmail design. The back can also be customized with the date or destination of the trip or an inspiring travel quote. For more inspiration, don’t miss this tech luggage tag idea for Uber that not only incorporates live tracking for the device as well as personalization with the recipient’s name for a one-of-a-kind tradeshow gift. And check out Brit+Co for a collection of DIY luggage tag tutorials, including this on-trend leather geometric example. The origins of a lanyard trace back to its nautical roots of being a short rope or wire rove used to hold and tauten standing rigging. From a military perspective, lanyards are cords worn around the shoulders to indicate various designations or decorations. 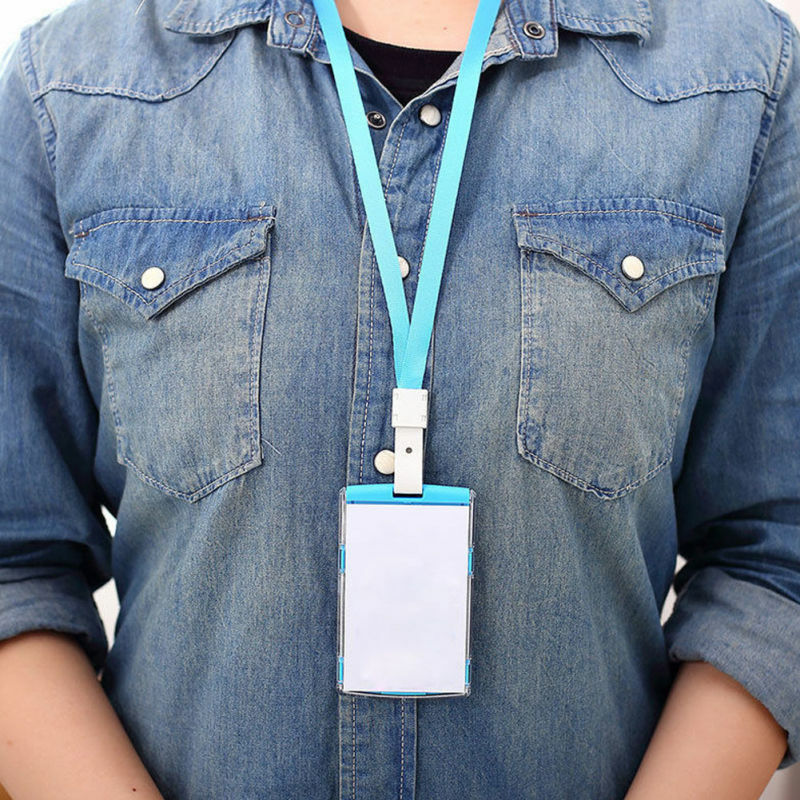 But in today’s terms, lanyards are most commonly known simply as a way to suspend a name badge around one’s neck for identification purposes. Lanyards can be made from a variety of materials: Polyester, knitted cotton, nylon or polyester cord, reflective ribbon, cork or neoprene. Some are even crafted to look like jewelry. And when not being used to hold IDs, they can also double as a keychain. They’re typically ½” to 1” wide and have any number of ways to attach a name badge from bulldog clips, snap hooks and o-rings to split rings, swivel hooks and retractable badge reels. And if safety is an issue, as with employees who work with heavy machinery, breakaway lanyards can be used, in which case the lanyard will separate at the breakaway point to prevent any injury to the wearer. The type of material used will depend upon the timespan it will be worn (a few days for a conference vs. long term for an employee name badge lanyard). To get an idea for all the creative ways they can be made, check out lanyards on Etsy. 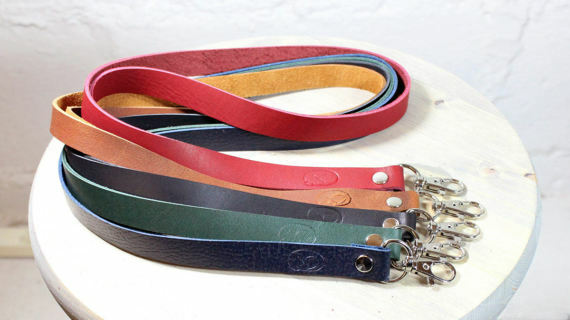 These lanyards from Etsy seller SleepyPupVA are made from a buttery-soft, oil-tanned leather are a definite upgrade. If you just need a few lanyards, you can learn how to weave one yourself. Or Skip To My Lou has a great tutorial for sewing custom lanyards from colorful fabric like these shown below. But if you need hundreds (or thousands! ), then you may want to source out a vendor in the promotional products industry such as Quality Logo Products, this vendor can create lanyards to spec in volume. You can also find a promotional consultant to work directly with you to create custom lanyards using this online directory. Plastic name badge holders are an easy and economical choice for housing printed name badges. 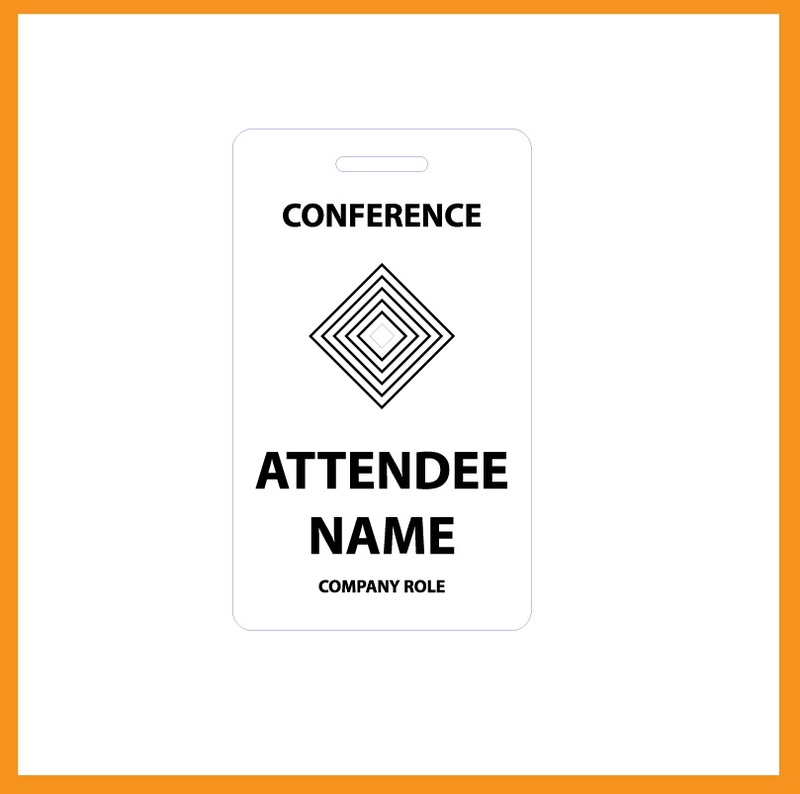 If your function has many walk-up attendees or your workplace frequently has guests on site that need temporary identification, using a clear plastic sleeve allows for quickly printing credentials. And these sleeves can be used repeatedly; just print a new name badge when necessary. You can buy holders on eBay, such as these shown below. Or if DIY is your thing, you could tailor this ID/wallet tutorial from Craftsy to your liking. Brooch-style clips are often used on name badges because of their ease of use and low cost. Depending on the material from which the badge is constructed, you’ll need to affix the name badge pins in some way such as double-sided tape, glue or epoxy. This video demonstrates how to place a pin with self-adhesive backing. You can buy name badge pins on eBay as well as from Etsy sellers such as SmartParts, who offers these plastic-with-metal-pin brooch-style backs. While pins are functional and allow the wearer to attach the name badge higher on the chest than where it is with a lanyard (making it more visible and easily read), many people don’t want to poke holes in their clothing. In this case, a magnetic back may be preferable. Magnetic name badges are often the preferred choice, especially with employee name tags or other name badges that will be worn often, because they can be used without damaging clothing fabric. Simply place the anchor bar inside a jacket, lapel or shirt with the front bar on the outside of your clothing. The magnets hold it securely in place. Magnetic name badges are also useful if there is a safety concern of wearing a badge on a lanyard that can swing outward and get caught when the wearer moves or leans forward. Many name badge vendors, such as Staples, offer magnetic fasteners as an option when ordering name badges. 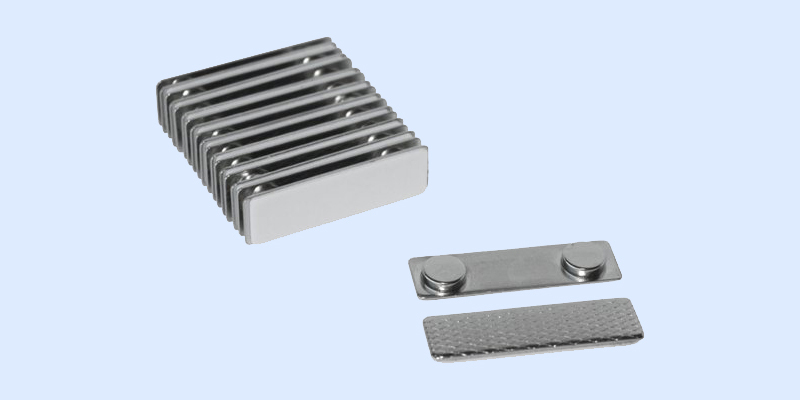 If you’re making your own, you can buy them on eBay or from Etsy sellers such as Total Element who offers magnetic fasteners like these shown below. Who is wearing the name badges? Are they young or mature? Trendy or conservative? The style should appeal to their preferences. How long will the name badges be worn? 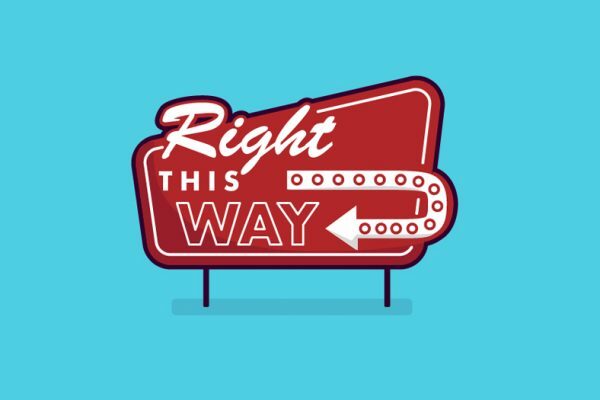 Short-term event vs. long term employee? What’s the environment in which badges will be worn? Will they be in a relatively clean interior space or will they be exposed to spills/dirt and need to be cleaned often? With these considerations in mind, take a look at the three most popular name badge materials: Plastic, wood and metal. Plastic is one of the most used materials for name badges because of its low cost, color selection and overall versatility. If you want to incorporate company or event theme colors into your name badges, then acrylic is the way to go. But just because plastic may be considered cheap monetarily, don’t think it isn’t high quality. 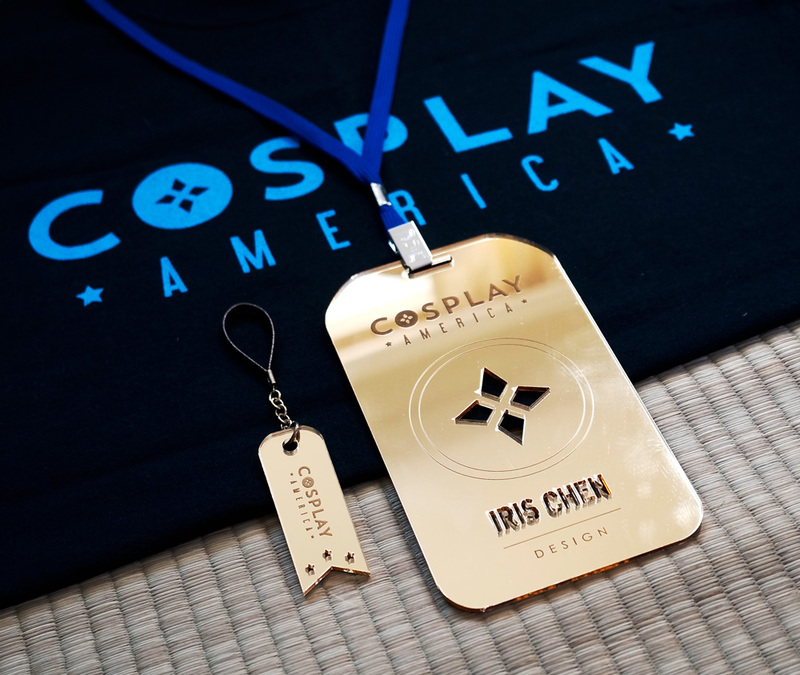 Just look at these gold mirror acrylic name badges that were used by Cosplay America as VIP gifts for an annual conference. Because Cosplay (the combo of “costume” and “play”) enthusiasts are an artistic bunch, the event planner wanted a name badge that would not only appeal to their VIPs’ love of DIY but also one that would grab attention + look amazing with costumes without detracting from them. Read the whole story here. Two-color acrylic is ideal for laser cutting name badges because the typography pops with the contrast. There are even two-color acrylics that have the appearance of a brushed metal finishes but without the price tag metal commands. Because plastic is highly workable, you can actually use it for DIY name tag projects. If you have just a few to make and want them to be artistically customized, get inspiration over at POPSUGAR on how to use shrink plastic (remember Shrinky Dinks anyone?) to create personalized name tags. 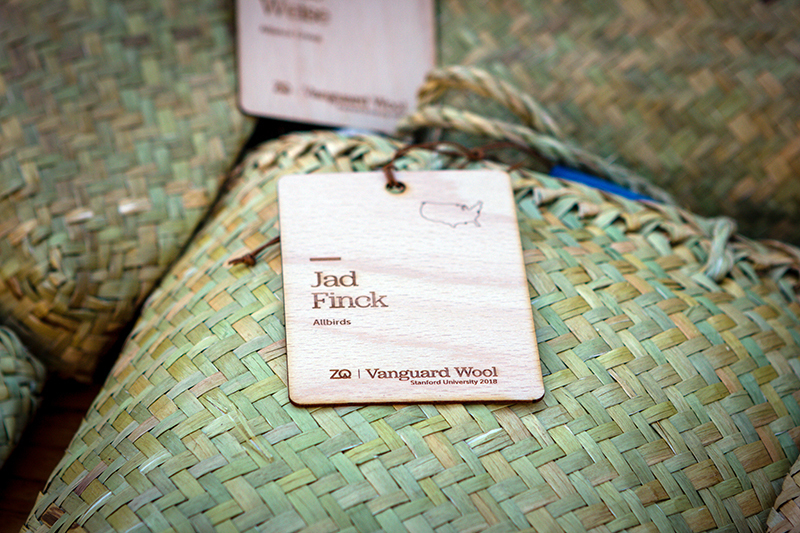 Wood name badges have a warm aesthetic and can be more eco-friendly than their plastic counterparts. This makes them appropriate for companies or events that cater to nature or sustainability such as alternative energy companies, garden centers, museums or even summer camps. They can also be used by those incorporating wood tones in their design choices such as hair salons, day spas or trendy restaurants. For inspiration check out the engraved wooden name badges from Etsy seller EngraveMeThis shown here. If you want to DIY, check out these ideas for making name badges via laser cutting wood. Transferring ink prints is another option for creating wooden name badges. This technique gives the consistency of computer-generated art while still having a handmade feel. Learn how to do it here. For those with drawing skills, try your hand at wood burning. The tutorial is here. 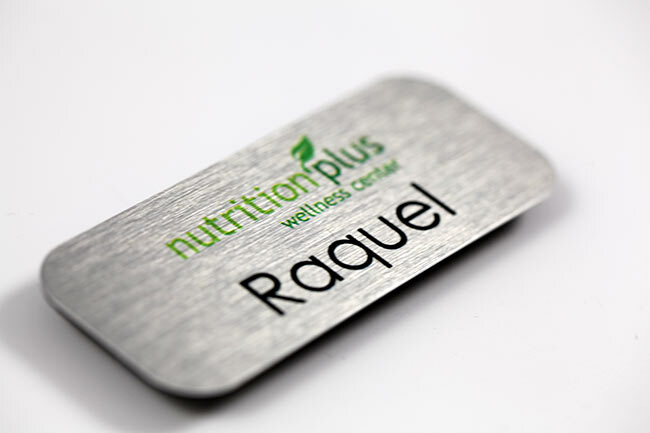 Metal name badges have a rich feel and are exceptionally durable. They tend to have a conservative aesthetic and are ideal for companies or events that have a professional vibe. Yep, lawyers and doctors, we’re lookin’ at you. But don’t think that metal can’t be hip. It has an industrial vibe that, with the right typestyle and/or logo, can appeal to a more youthful set. You can print on them or engrave them—or both. They’re available through promotional products distributors or office supply companies. For example, Office Sign Company offers these full-color metal name tags shown below. If you want a more casual feel but still want the strength of metal, you can make name tag buttons using a button press machine. Check out how it works at Wikihow. So how can you find success when designing your name badges? The main consideration is readability. If the person’s name is illegible because the typestyle is too small or too detailed, then you’ve reached #epicfail. After that, the criteria become a bit more subjective. What’s appropriate for a business conference isn’t going to be the same as what’s needed for a high school reunion or for employees in a retail store. Here, it’s about context. Additionally, you must consider what your audience needs to know and then design to meet those needs. For example, job title or location may not be a big thing when walking a tradeshow floor. But if a large company has an annual sales meeting with team members from across the country attending, then it’s probably helpful to know which office the person works from and what they do. If you’ve ever been to a Disney theme park, you’ll notice that the cast members usually have hometowns on their name badges. With employees from all over the world, it gives park visitors a conversation starter if they’re from the same place. Quantity and budget are also considerations. If 15,000 name badges are needed for an international business summit that lasts three days, it makes more financial sense to print disposable paper badges for use in plastic sleeves than to create permanent metal name tags. For some additional insight on the key design elements for successful name badges, check out GEVME. Both Sides also has some strong opinions on what should and shouldn’t be included on name badges. We agree with some, not necessarily all. You decide. If your identification needs are more casual in nature, check out some ideas for cool DIY name badges from Brit + Co and get more ideas on Pinterest. 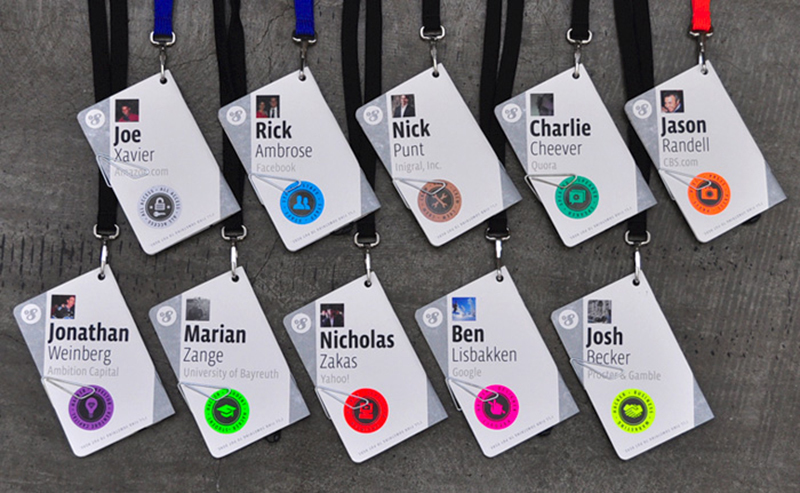 Depending on your audience’s needs, some name tags can do double duty like these below that were used for a Facebook developer conference. While these may look like traditional name badges, they’re actually event booklets with all the conference details such as agendas, maps and much more. They were designed with the hole in the corner so wearers could review the info inside without having to remove the booklet from the lanyard. And since they hang at an angle, there’s more space for attendee names to be in large, legible type. Get the whole story here. Bottom Line: Good design matters. Name badges are functional items, and should be made so that they function well and meet audience needs. But this doesn’t mean they should be boring or lack strategic thought. Add in some flair and you’ll have name badges that anyone would be proud to wear.